Results for the Kuwaiti parliamentary election on Saturday show strong gains for religious conservatives. Women candidates failed again to win a seat. Sunni and Shia Islamists won nearly half of the 50 seats in the National Assembly, which was dissolved after a stand-off between the cabinet and MPs. The whole government resigned in March, saying they could no longer work with MPs who "interfered" with their work. Economic concerns dominated the poll in the oil-rich Gulf emirate. Turnout was said to be modest in the morning heat and dust but had picked up by evening to end at an estimated 60%, according to electoral officials. The majority of Kuwait's 2.9-million population is made up of expatriates, who do not have a vote. Military personnel are also ineligible to cast ballots. More than half of the 360,000 Kuwaitis eligible to vote on Saturday were women. However, none of the 27 women candidates who stood were elected - the second time this has happened since the emirate's electoral law was changed in 2005. 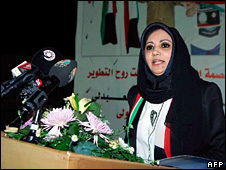 The liberal candidate, Aseel al-Awadi, the only woman supported by a political group, narrowly missed out on being elected. Kuwait remains a traditional society and some women may have been influenced by conservative male relatives who do not want them to vote for female candidates, the BBC's Julia Wheeler reports from Dubai. Instead, Sunni and Shia Islamist candidates won 24 seats, more than they won in the last election in 2006. Liberal candidates and their allies won seven seats, one fewer than before, while the nationalist Popular Action Bloc led by the speaker, Ahmad al-Saadoun, lost one seat to end up with four. Rising food and commodity prices were at the top of the agenda for many Kuwaitis ahead of Saturday's vote. Kuwait may sit on 10% of the world's oil reserves - a commodity currently selling at record prices - but as a small desert state it is obliged to import most of its food, our correspondent says. The oil price is denominated in a weak dollar but about a third of imports are paid for with the strong euro, affecting ordinary people on a daily basis, she adds. Election campaigning came to a halt this week with mourning for the former Emir, Sheikh Saad al-Abdullah al-Sabah, who died on Tuesday. Last-minute campaign rallies had to be cancelled but the government said it was determined not to postpone the election itself. Kuwaitis are proud of their democratic record, our correspondent says. They live in the first Gulf state to have had a parliament and it remains the national assembly with the sharpest teeth. Although the emir is able to dissolve parliament and the introduction of women standing and voting was relatively late in Gulf terms, MPs have more of a voice than their counterparts elsewhere in the region, our correspondent says. Saturday's election was designed differently to those previously, our correspondent reports. The number of constituencies has been reduced from 25 smaller ones, which varied considerably in size and electoral roll, to just five large ones in order to reduce the possibilities of vote-buying and voting along tribal and sectarian lines. This time voters made up to four choices each from inevitably long lists of candidates, making the process at the voting booths more complicated and harder to predict.